A great number of publications exist about the meaning of dreams and what they want to tell you. When you compare these books and articles you will find many differences and contradictions but some interpretations are the same throughout different cultures and different authors. This doesn’t scientifically mean that they’re 100% right but for sure they are worth taking into consideration if you want to know more about your own dreams. Reflecting upon your dreams can be particularly rewarding when you try to break bad habits such as compulsive behaviors and addictions (smoking, overeating, alcohol, weed etc.). When you want to change your behavior you should identify the underlying reasons for why you do what you do. Often they lie somewhere in your subconscious mind. Dreams are like a door to your subconscious mind. Therefore, dealing with your dreams can help you change your behaviors. 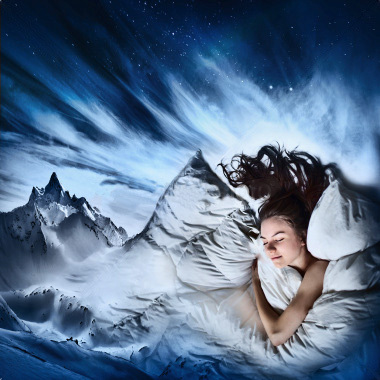 Here are some of the most common interpretations of dreams. When you dream of rivers, creeks and waterfalls you’re in harmony with yourself. If the water is pale or frightening, though, you should think about whether there are unre-solved issues which need to be addressed. If you dream of blue sky, it is a sign of freedom and of giving up bad habits. These dreams might occur after you started giving up undesired behaviors. They should encourage you to continue on this path. Sunshine and high temperatures represent affection and feeling comfortable. A grey sky and chilly temperatures mean isolation, being alone and being afraid of something. Think about making new friends and realize what causes those fears that you might suffer from. Maybe you can talk about those fears to other people and hear their opinions. If you move to another place or if you travel in your dreams you probably experience major development in your life. Take some time to digest those developments. Sometimes it’s good to stop for a while and check whether everything that’s happening in your life is moving you into the right direction. If it doesn’t you may feel unbalanced and crave for quick compensations and relief – such as alcohol, cigarettes, sugar etc. If you try to escape but without success then there might be too much stress in your everyday life. It could be the job or your partnership or other things. Make a plan how to reduce stress through solving problems and designing alternatives. You’re without clothes: this dream either means that you feel unprotected or that you fear others to reject you – for example by finding out secrets about you. You slide and fall…the most frequent nightmare across various cultures and ages – and especially typical for boys and girls: Others (parents) disappoint you or don’t help you when you need them. You feel alone and rejected. If you suffer from this nightmare, think about how you can help yourself or how you can reach out to others. If you’re in a relationship it might also be appropriate to share your dreams with your partner and express your worries and concerns. Death and funerals in your dreams can mean that you digest a transition in your life when you let go of somebody or of something. Maybe it’s the drug that you want to get rid of. It’s particularly important that you get aware of what it is. It shouldn’t eat you up and drive you into the behaviors that you want to get rid of. Many people return to places where they lived as teenagers or as a boy or a girl earlier in life. If this is a common pattern in your dreams it might mean that you still long for the love of your parents or of your school mates. It can also mean that you relive old situa-tions hoping for better outcomes than in the past. Obviously, this won’t happen. Often, these dreams disappear when you drag old memories into the light. Become aware of old and still unresolved conflicts and accept that what happened back then can’t be changed today. If you made mistakes back then, forgive yourself. These were just a few of the most common dreams. If you want to use them to learn more about your subconscious mind and about the underlying drivers for your behaviors, then take five minutes in the morning – after waking up – and write down what you dreamt about. Later during the day you can reflect upon those dreams and what they might want to tell you. The more you engage into this kind of analysis the better you will feel. The better you feel the less you will feel the need to engage into undesired behaviors. It can be the start of a positive cycle. I’m Frank Lavario , founder of the Lavario self help programs against addictions. I worked with addicts in three continents, mainly in the US, Germany, Italy and Brazil. I regularly write articles about topics around addictions and psychology.